Salaash, our friend and Masaai guide, got us out early and we found mom and her 2 cubs. They were very active as it was about 6:30 AM. 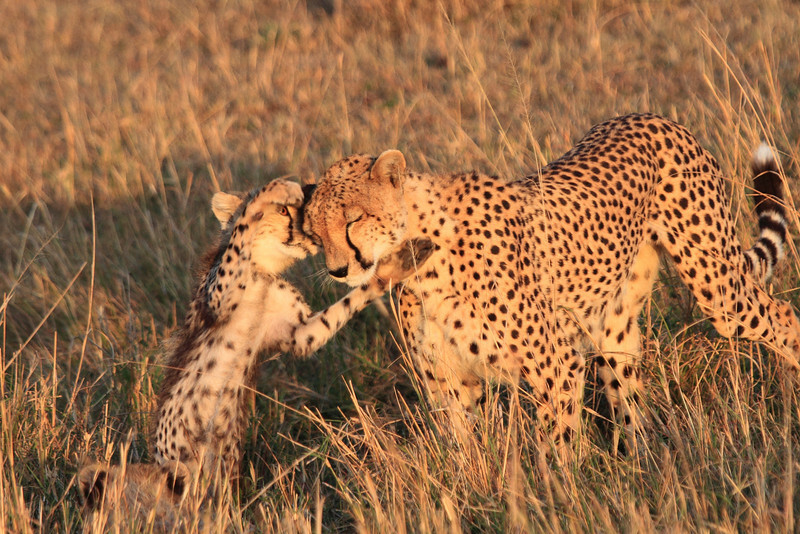 They played and often used mom as a play and practice toy. Then mom found a baby Thompson's Gazelle and brought it back for the kids. Who tried to get it while in moms grasp. She put it down for them and after a little while, you will SEE when this happens, sees another baby Thompson's and goes for it. Gets it first try. Meanwhile the first gazelle was NOT dead and the kids chase it and bring it down. Eventually they dined on it. The second, and very dead, gazelle was just left there. There is also a video of mom finding the first Thompson's Gazelle and getting it in her mouth. Got to teach the kids early.